Dave Fox offers a diverse series of travel writing and cultural adaptation workshops to help students and educators maximize experiential learning in educational travel programs. 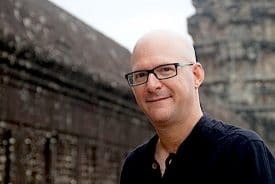 One of the leading world experts on travel journaling, and author of the bestselling book, Globejotting: How to Write Extraordinary Travel Journals (and still have time to enjoy your trip! ), Dave teaches travelers of all ages how to have richer and more insightful cultural and personal-growth experiences through journaling and travel tale writing. He encourages travelers to challenge their reactions to people and things they don’t understand, and teaches how to view foreign cultures from a diverse variety of perspectives. For more than two decades, Dave’s lively and enriching workshops have helped thousands of travelers discover more meaningful travel experiences through journaling. “A lot of people try to write a travel journal, but they struggle to capture the full spirit of their journeys in words. For some, an even bigger challenge is simply finding time to write in the middle of an exciting trip,” he says. Originally from the United States, and currently based in Ho Chi Minh City, Vietnam, Dave offers workshops for both students and educators to help international schools get maximum educational value out of their educational journeys. He is available to teach his workshops worldwide.